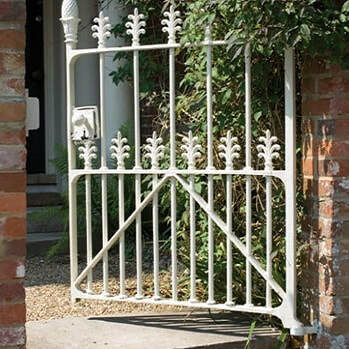 The following guidelines apply to the Exterior Eggshell and Full Gloss finishes, suitable for use on exterior railings, gates, guttering, furniture and other metal surfaces. Ensure the surface is sound, clean, dry and free from dirt, grease and any other contamination. Fill any cracks, holes and open joins with appropriate exterior filler. New and previously painted metal surfaces should be thoroughly degreased. Remove any rust or weak paint back to bare metal. Apply two coats of Farrow & Ball Metal Primer & Undercoat in the correct color tone for your top coat. Allow a minimum of four hours drying time between coats. New and previously painted metal surfaces should be thoroughly degreased. Remove any rust or weak paint back to bare metal. Treat with Etch Primer or Mordant Solution taking care to follow the manufacturer’s instructions. Apply two coats of Farrow & Ball Metal Primer & Undercoat in the correct color tone for your top coat. Allow a minimum of four hours drying time between coats. When using more than one tin of the same color check that the batch numbers are the same (see the base of the tin). If not then mix the tins together before use. Stir paint thoroughly before use. Apply two coats using a brush or roller. On application of the final coat lay off the paint in a single direction. Exterior Eggshell and Full Gloss are dry in two hours and can be recoated in four hours. Clean brushes with warm soapy water.